Sanding a wood floor and then seeing it all come together during the finishing process is the most enjoyable part of our work. What we really find to be the most satisfying thing about working in the wood floor restoration trade is having the opportunity to bring some life back into an ancient floor and transform it for people to enjoy for many years to come. The famous oil painting seen here is called Les raboteurs de parquet (The Floor Scrapers). 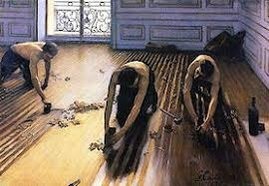 It was painted in 1894 by Gustave Caillebotte and shows just how hard these floor renovators worked in the old days.Hard graft remains the prerequisite for flooring guys, but the two key techniques required nowadays for a genuinely awesome restoration are precision, and a delicate touch. Extending our floor cleaning services to include wood floor renovation became a completely new learning curve for us. As at all training courses, the floor especially laid for demonstrations was intact and in pristine condition. However, afterwards we found that many of the enquiries for buildings needing refurbishment were really quite ancient. We then had to start to try and think like floor layers did many years ago when they originally installed the floors in these old buildings. They carried out many of the procedures by hand using quite primitive carpentry tools, always using a 'trained eye' and sense of touch. We still use some of the old historical hand tools for restoration work, and have found a valuable source for acquiring such antiquated paraphernalia from a shop in the north of England - see a link to their website on our LINKS page. This wonderful outlet has been selling workshop tools, fixings and ironmongery for over 200 years and a visit to their shop is like stepping back in time. The store incorporates a Museum on two floors - downstairs you can find a large collection of locks and chisels from Tudor to present day. Upstairs is the original tin-smithy & plumbers workshop, this contains hand tools, anvils, vices and hand machinery. The owners have recently discovered it was in use in 1829, several years before the shop actually opened. The old furnished office is also upstairs with desks, a pre QWERTY typewriter with various paperwork and many pre-war items are set-out just as it was all those years ago. Nowadays, we use more powerful machines which are far safer to operate without the need for wearing a protective dust mask most of the time. However, some of the materials used by wood floor fitters in the old days included dangerous products such as bitumen for gluing parquet blocks and shellac for finishing. So we still need to wear a protective face mask when removing, lifting or cleaning some of these as they can contain hazardous chemicals which may become airborne when disturbed. Even with the latest equipment, there's still no substitute for the 'trained eye' and a good sense of touch is still relied upon to achieve a good result. These special skills can only be learned by on-the-job experience and we can usually tell within a short period of time whether a new recruit has the aptitude or not. Every member of the team trained by Floorfixer has initially shown a flair for working with wood. They have initially shown a natural talent to learn the knack of knowing what selection of tools will be needed for each particular task, and which skills to use in order to transform a tired old floor into a thing of beauty to be admired. Historically, the use of wood as a covering material for floors in houses rarely existed, and up until the 17th century flooring was made of compacted clay. Over the years, a great variety of timber has been used and most species have proved to be an extremely durable, resilient and attractive feature. Wood species in old buildings can vary from rough sawn softwoods containing many knots, to the more expensive and durable hardwoods which are usually found in higher status properties. Solid wood parquet was introduced to the UK during the 17th century as described in our page titled History of Parquet. By the mid 18th Century, varieties of slow grown softwoods such as Scots Pine, or imported Yellow Pine was installed in domestic properties and the floor surface eventually became smooth as people walked on it without sanding and finishing as we do nowadays. The earliest wooden flooring comprised of rough planks laid directly at right angles onto the line of structural joists and nailed down at regular intervals. Sometimes if the supporting joists were unevenly set, the underside of the plank was chiselled down with a joiner's framing axe in order to get a level floor. Builders soon found that adding a wooden floor added to the general strength and stability of an entire building. Timber merchants eventually developed a method of preparing floorboards with a tongue and groove at the edges. Nowadays floor-layers firstly attach each board with nails driven through the upper level of the tongued edge. The groove in the following board subsequently covers the nail-head and this technique is called 'secret nailing'. Shellac was often the preferred choice of finish on wood floors in the past. Although it is not a suitable coating for floors; its main purpose is with French-Polishing or when trimming furniture, window and door casings. This wood finishing product was extensively used years ago, and we have found that old floors previously finished with shellac will clog the abrasive paper on a modern sanding machine. This can create a nightmare for us professionals who sand floors properly, and it takes lots of practise to develop a special technique for removal of some unknown finishes. The Floorfixer team have learned many strategies to improve their art and these skills have been honed over many years by mastering a carefully guarded trick or two on the way.